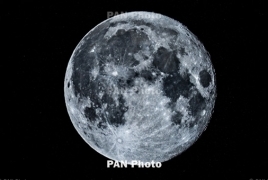 PanARMENIAN.Net - The most commonly accepted theory for the Moon's creation involves a collision between Earth and a Mars-sized body (Theia) that split off a chunk of the larger body and created an orbiting neighbor. You might have to reconsider that explanation, however. NASA researchers have developed a new model that suggests the Moon is made of the same materials as Earth, not its cosmic nemesis. The approach simulates the processes of the Moon's formation using 14 volatile, metal-loving elements found in samples from the Apollo missions, providing a complex understanding that hasn't been attempted before. The concentrations of those elements could speak volumes about what happened, according to the scientists, Engadget reports. The simulation found that there was a "strong" correlation in elements between the Earth and a Moon made out of its material, but that the same wasn't true for a Moon made out of the Mars-scale body. There's an explanation for those remaining five elements, too. They have substantially lower concentrations in the simulation, leading researchers to theorize that the elements didn't re-condense after the impact and separated from the material that would become the Moon. You won't want to toss out your existing knowledge just yet. There's more research necessary to understand the environment of the post-collision disk. This early work fills holes in scientific data that have existed since the 1970s, though, and it could serve as a launchpad for more research. If that work validates the early hypothesis, you might end up looking at the Moon in a very different light.